You are currently browsing the tag archive for the ‘stormwater’ tag. 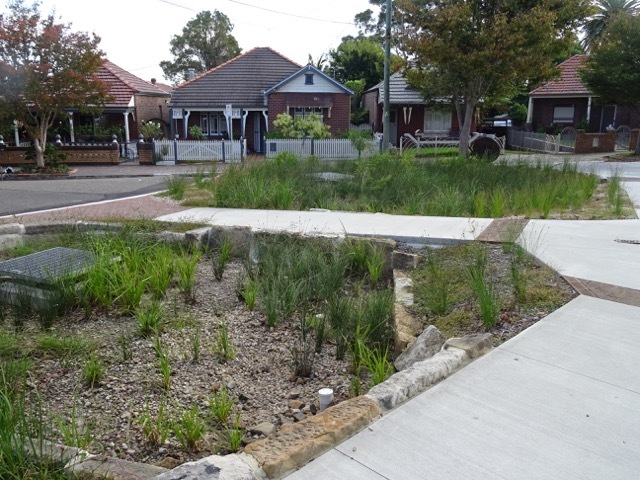 A very large rain garden in Alice Lane Newtown. This new development also planted numerous trees. A 2°C rise in global average temperatures, is expected to cause an 11.3% to 30% intensification in rainfall from extreme precipitation events in Australia. Other areas will be more susceptible to drought. More intense rainfall extremes will likely cause a problem with stormwater, so it is just not an issue of sea-level rise, but also more rain, which has to go somewhere. In the Inner West, our sewerage / stormwater infrastructure is aging & “at capacity” – or so I once read in a Marrickville Council paper on the subject. The level of new development, predominantly high-rise, will significantly add to this load, so I guess we need to expect more flooding. 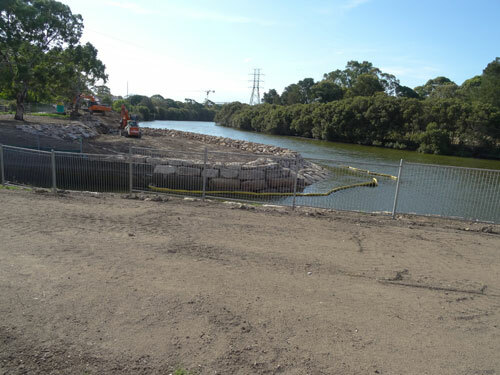 Inner West Council (nee Marrickville Council) has done quite a bit of work building swales & raingardens around the Cooks River. Once water is in the swale or raingarden, it can seep into the ground naturally. This process cleans it of pollutants such as oil, grease, particulate matter, litter, heavy metals & fertilizers before the water reaches the river or replenishes groundwater stores. Until I read about it I had never considered that litter tossed in the street at Newtown or Enmore could reach the Cooks River & I am sure most people don’t think about or know of this either. Council has also been slowly creating verge gardens for a number of years. These not only cool the streets & add beauty & pockets of habitat, they also help capture stormwater. Choose to have as much ground surface available on our property. This means not creating large expanses of concrete driveways or concreting our back & front gardens. All water that runs off your property causes a problem somewhere else. Depave any unnecessary concrete in your property. Every bit of depaving helps. We can agree to a street tree out front if Council asks us & look after it if one is planted. Trees are very good at capturing the rain & holding it in the canopy. Rainwater either slowly drips to the ground or is absorbed into the atmosphere by the process of evapotranspiration. Create & look after a verge garden. Plant tree/s & add living plants to everywhere we can – ground, roofs & walls. 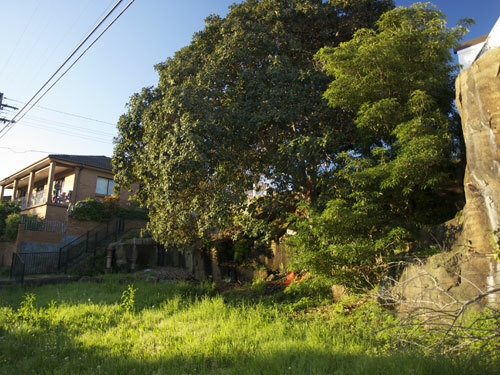 With all the development happening or about to start across Sydney, local councils & planning bodies would do well to insist that developers retain as many mature trees as possible on development sites. Instead of installing underground pipes to take stormwater from the site to the collective sewerage system, it would be better if they did not over develop the site & planted more big canopy trees & other vegetation as these would help slow down some of the stormwater. Adding a raingarden would be good too. Our city is changing rapidly. Climate change is happening & expected to worsen. How well we live & our quality of life very much depends on how we create our environment. We will be much better off if we depave, if we plant medium to large growth trees & if we add living plants to everywhere we can – ground, roofs & walls. We need to start to plant to keep cool & to help manage stormwater. I do not understand why new high-rise developments are allowed to build right to the front footpath. Not only is this unsightly, but it also subjects residents of the building to all the terrible & significant health issues connected with particulate matter & other air pollutants from the passing traffic below. It would be far nicer & healthier for everyone if a 2-5 metre space (depending on the size of the property) were left between the front footpath & the building to plant shrubs, trees & other vegetation. 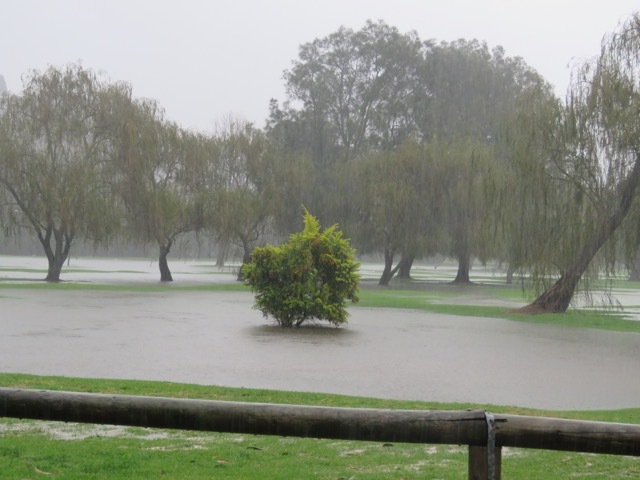 Marrickville Golf Course with the Cooks River visible behind the tree. 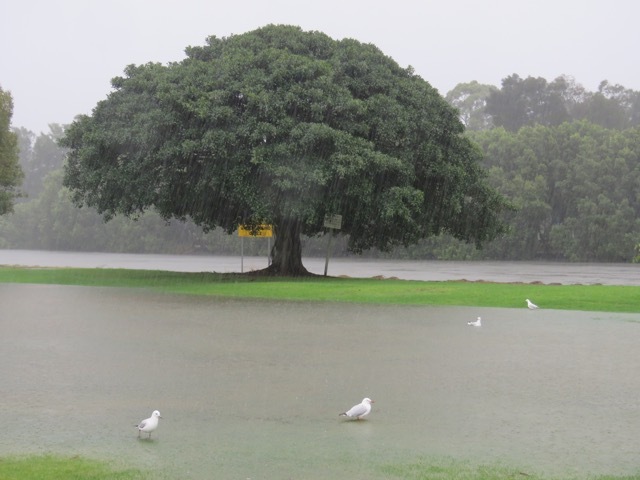 The rain is tonight being called a ‘storm emergency.’ I stay inside when it is raining heavily, so always miss what is happening down at the Cooks River. Not today. I decided to brave the weather & take some photos. The flooding was not as bad as I expected. The Cooks River at 1pm, high tide time, was around 20 cm below the bank, but I saw a photo on Facebook where the river had breached the bank this morning. Unfortunately a tree is down in Mackey Park. From what I could see trees did pretty well considering the destructive winds we have been experiencing. 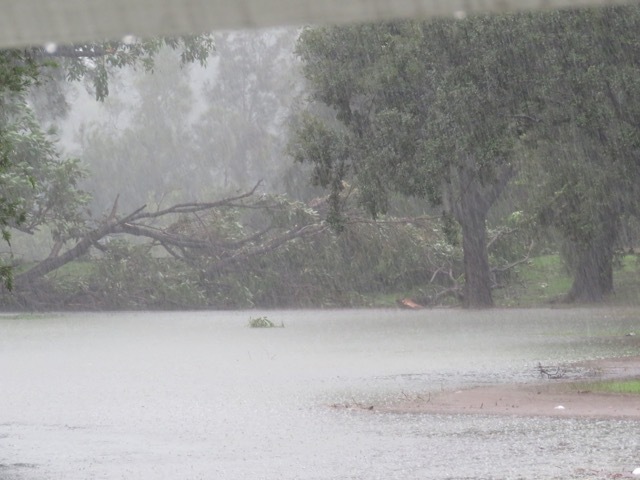 The Weather Bureau says more destructive winds can be expected, which may reach speeds of 125km/hour. Stay safe. 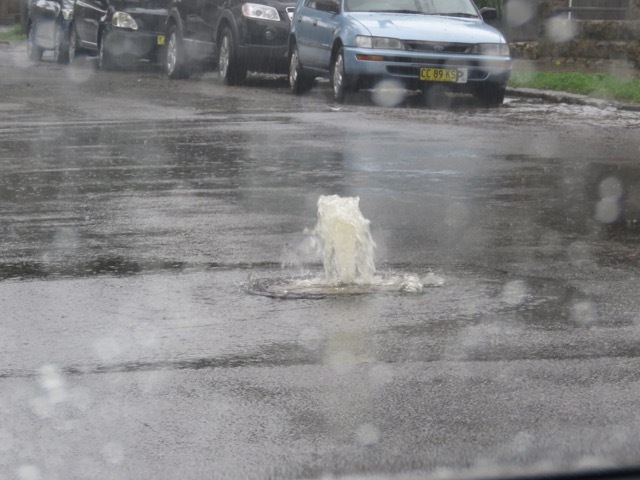 Stormwater drains in Carrington Road turned into road fountains. The north end of Carrington Road was blocked to traffic due to flooding. Looking down the lane from Albermarle Street. Railcorp land is on the right. 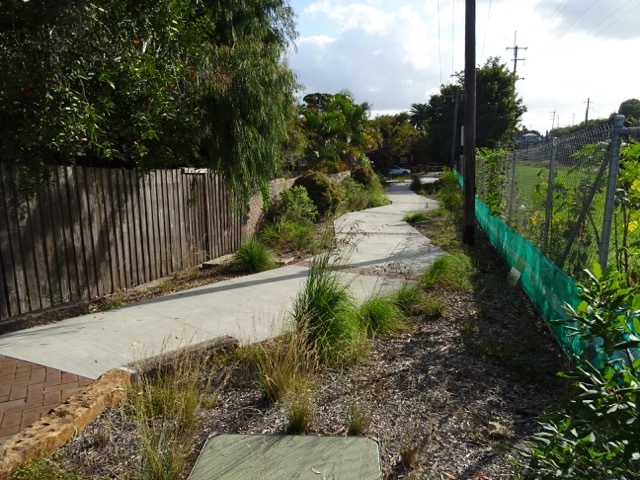 In June 2015 I went to look at the works by Marrickville Council in Kays Avenue East laneway in Dulwich Hill. The lane travels between Kays Avenue East to Albermarle Street along the railway line. I visited again recently to see the completed works & the planting done by the community. It looks good & is a big improvement from what was here before. I love the curved path & the rain gardens, which have already been put to use with the recent wet weather. We all benefit whenever these kinds of spaces are greened up. One day I hope that this kind of environment is the norm around the inner west. The rain garden along the laneway. Two large rain gardens fill the space at the end of the cul-de-sac — a good use of a large expanse of bitumen. 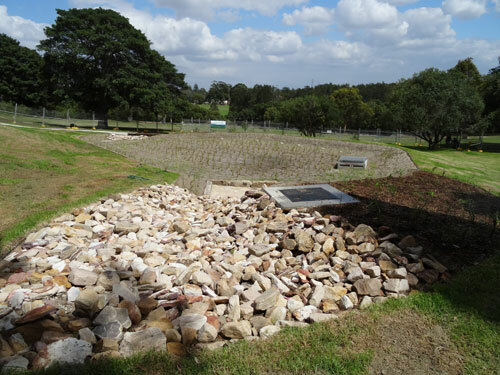 These rain gardens will help clean the stormwater before it reaches the Cooks River, as well as help lower the urban heat island effect. Streetscape beauty & habitat is another outcome. Look at the size of this rain garden & it is only one of two on this corner. 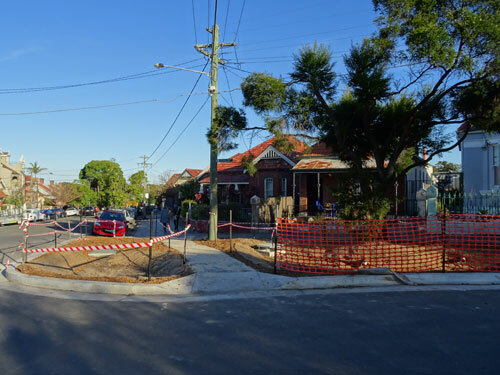 After completing community consultation that started in July 2014, Marrickville Council has started building a rather impressive rain garden in Scouller Street Marrickville. 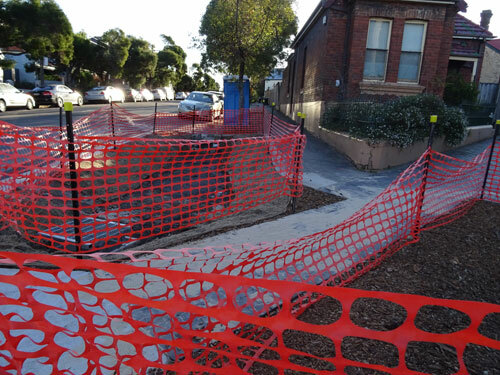 Actually, they are four rain gardens – two on each corner of Scouller Street at the intersection of Juliett Street with the footpath traveling between them. The road has been narrowed on both corners allowing more land to be claimed for the rain gardens & for what appears to be landscaping. Only two parking spaces were lost to create so much gain. 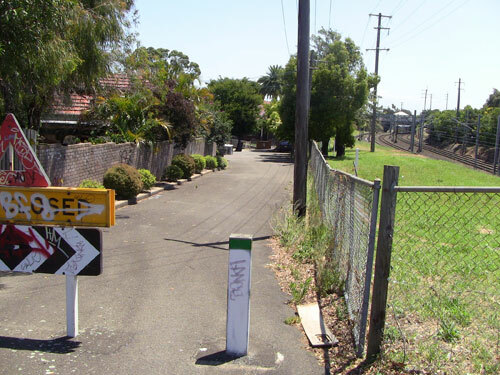 This street is part of the Eastern Channel East Subcatchment that carries stormwater all the way to the Cooks River. Quite incredible really as this is the top end of Marrickville; almost Enmore. The rain gardens will clean & filter the stormwater, as well as improving habitat. Narrowing the road for the rain gardens will also help slow traffic. Scouller Street is one of those lucky streets that have old brick footpaths. Not only are these attractive in my opinion, I assume that they are also permeable to a degree. 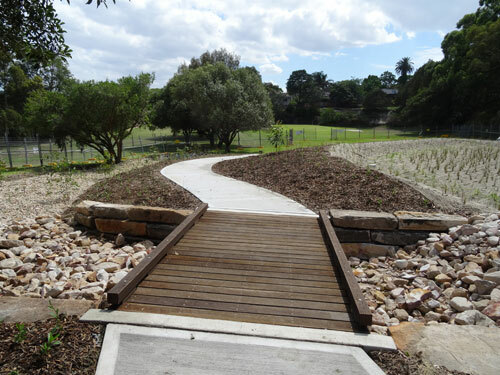 Council has retained the flow of the brick footpath between the rain gardens, which is great. Even now it is easy to see how these rain gardens will increase the beauty & amenity of this corner & have a positive impact for local biodiversity. Work has a way to go yet, so I will write an update once it is finished. Well done Marrickville Council. I think this is going to be fantastic. Showing one & a bit of another rain garden. The brick path continues through the middle. Narrowing the road has allowed for significant sized rain gardens to be built. This intersection is going to look wonderful as well as serve a very useful purpose. Either side of Cup & Saucer Creek is being naturalised by Sydney Water. Apparently there are turtles in the Cooks River. The pond or wetland area on the far side of Cup & Saucer Creek. I hope the fence becomes a thing of the past. 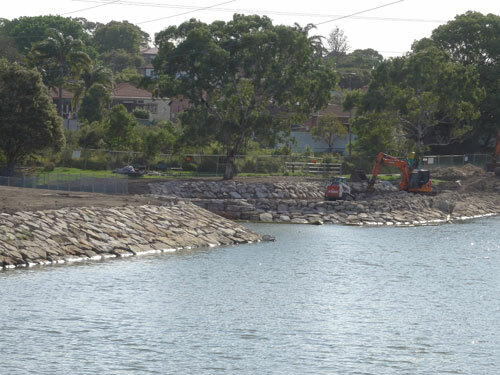 Sydney Water has removed the ugly concrete bank, the fencing & twelve trees to install a sloped riverbank constructed with sandstone boulders. This area will be planted with lots of new trees & native plants, bringing a softer, more natural feel to this part of the river. 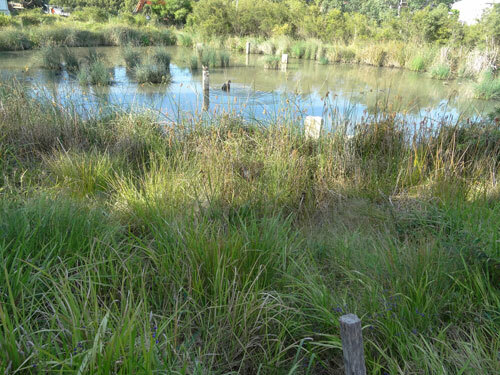 On the Canterbury side of Cup & Saucer Creek, they appear to be building another pond – or it may be a saltwater wetland. A large swale has been created, which would take water from the wetlands to this area. Whatever it becomes I am sure that it will be wonderful. 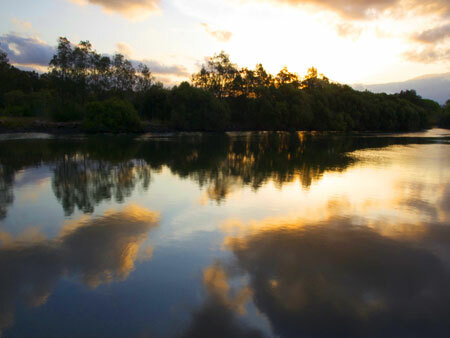 Personally, I think the Cup & Saucer Creek Wetlands is the best work that has been done along the Cooks River. The wetlands not only clean storm water before it enters the river, but they also bring an astonishing beauty to what was once just another area of boring lawn. The biodiversity in this area has increased exponentially with the wetland offering the community a peaceful place to watch waterbirds in their natural habitat. 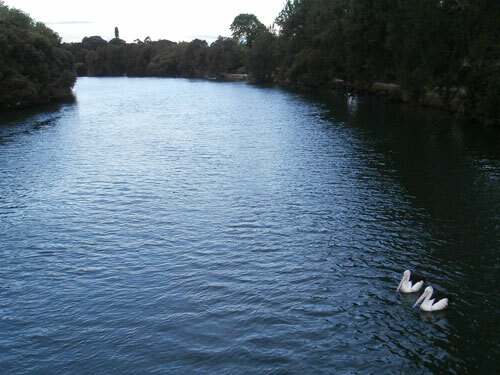 If I were to recommend visiting just one place along the Cooks River, this would be it. The naturalization works can only enhance this section of the river making this special place especially attractive to those who love wildlife. I can’t wait to see the work completed & will post an update later. Fabulous work Sydney Water. Cup & Saucer Creek with another view of the pond or wetland area. The swale from Cup & Saucer Creek Wetland. The very beautiful Cup & Saucer Creek Wetland. Last year I read a Council document that said Marrickville had reached capacity for the sewerage system. This is before the development of the expected new housing. 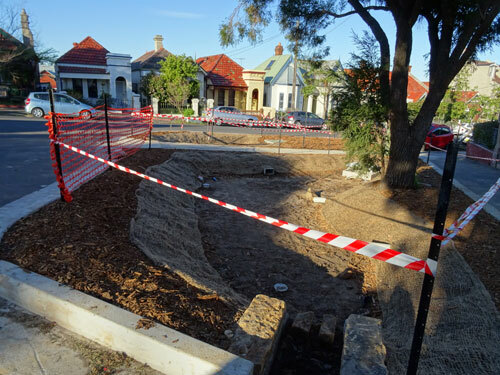 Therefore it is understandable why Council is working hard with their sub-catchment plans, building rain gardens & devising other ways to manage & direct stormwater into the ground. Yesterday I read an article about bioswales that are starting to pop up along the streets in New York City. The bioswales look like very attractive verge gardens with a street tree or two & surrounded by a short filigree wrought iron fence to protect the plants. Instead of a verge garden that has limited abilities to catch & retain stormwater (though they are still way better than concrete), each NYC bioswale is 1.52-metres deep (five foot) & can absorb 7,570-litres (2,000-gallons) of water every time it rains. They have disposed of adding a hole in the kerb for stormwater to enter. Instead, they have made it so the surface around the kerb directs stormwater to the swale. They have also left a large unkerbed entrance so that all the stormwater enters the swale. 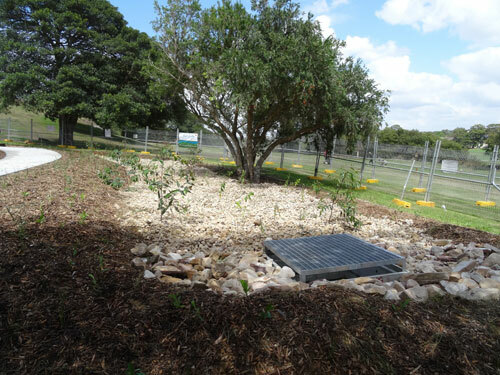 Any stormwater that enters the ground rather than the drains saves money. In the case of NYC, the savings amount to billions of dollars. Stormwater that goes through the ground as nature planned, gets cleaned by the process before it enters rivers, streams & lakes or the groundwater system. NYC’s sewerage infrastructure is similar to Marrickville Council’s in that it was built when the city/suburb was young. Stormwater that didn’t enter the ground was easily incorporated into the drains system. Now that hard surfaces & the population have increased, the system is working to full capacity. NYC intends to build thousands of street side bioswales & expect to eventually have the most bioswales in the world. The photos in the article show that they use a variety of plants, including flowering plants. Add thousands of bioswales to their Million Tree program, their pocket park projects, plus their green walls & green roofs & I think NYC will manage to provide a livable & attractive environment while adjusting to the raised temperatures caused by global warming. We know there is a clear connection between access to good green space & the quality of the urban forest to mental & physical health. Marrickville municipality has the least green space in the whole of Australia & researchers from Deakin University found that in 2010, Marrickville was the unhappiest suburb in Australia. 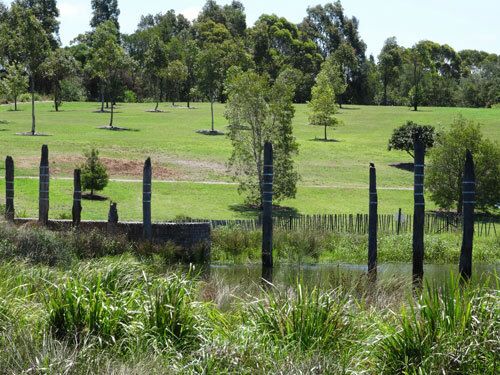 For residents of Marrickville municipality, our urban forest & parks are of vital importance & will become more so with the fairly intensive development on the horizon. Approval has been given for 12,000 new residences, so there will be more people using the limited green space. Hopefully developers will stop building right to the footpath & will include trees & green space in their housing developments, as this will increase livability & make for happier residents. One thing is certain; we cannot afford to lose any of our public green space & what we have needs to be made so that it is inviting & useable. We have a number of great parks, but we also have green space that is no more than an empty block of grass. This is a wasted opportunity that whether consciously or not, has a negative impact on the immediate neighbourhood. Parks are more than a piece of ground with a few trees & grass. They are essential to neighbourhood & community wellbeing. To complicate matters, we all have different ideas of what makes a park great. Some want natural bushy sections; some want a playground, while others want playing fields. If a park is big enough, it can incorporate all of these aspects. Pocket parks however have limited space & so often have a limited ability to meet a range of needs. 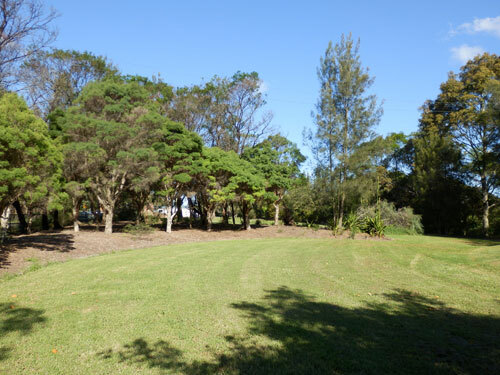 A good example of a virtually worthless pocket park that fortunately Marrickville Council are going to upgrade is Murdoch Park in Illawarra Road Marrickville. Until recently it was called Murdoch Playground, yet there was nothing in this park except grass, a concrete path from one side to the other, two old broken concrete benches & some signs. Council intends to spend $20,000 upgrading this park in 2014 by adding plants, shade trees & new seats. I imagine it will go from a place that no-one uses to a place that people will use, all because it will have been made inviting. I am looking forward to seeing what Council does. If Amy Playground is a benchmark, I expect it will be good. Parks can show off a suburb if they are great. If they are empty, ugly or in disrepair they can negatively effect perceptions of that neighbourhood & can also attract criminal behaviour. Therefore beautiful parks are a bonus to the neighbourhood & their presence has far reaching impact. Parks can revitalize a community. They can bring people outdoors & break down barriers. People can make friends in parks because they may be doing the same activity allowing them to feel comfortable speaking to people they do not know. Children’s playgrounds & exercise areas are a great example of this, as are dog-walking areas. Everyone knows that if you want to meet people, walk your dog or even someone else’s dog. Great parks also attract older people & so can break down age barriers. Parks offer respite & if designed as such, can offer peace away from the hubbub of traffic, noise & other human activity. Central Park in Manhattan is a great example where one can find peace & quiet in a city of 1.619-million people (2012) living in an area of 87.46 km². Much has to do with both the size (340-hectares) & design of the park, as well as the 24,000 plus trees. By comparison & closer to home, Sydney’s Royal Botanic Gardens cover 64-hectares (Botanic Garden: 30-hectares & The Domain: 34-hectares) & between them they have approximately 4,770 trees. Research has found that people who only have a view of concrete experience greater levels of aggression & violence & their children have a greater range of psychologically aggressive behaviours, than those who have a green outlook. This shows that it is better for your family’s health is you forgo the stamped concrete driveway or concreted back garden & put in the least amount of hard surfaces as you can. Green is far better for mental health than grey surfaces. 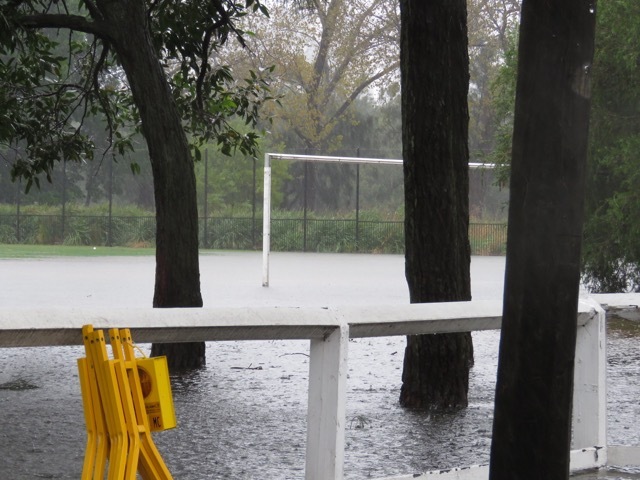 Parks also absorb stormwater & cool the urban heat island effect. I was surprised to read that the Western Channel Subcatchment in Marrickville South has 78% hard surfaces. This is terrible for stormwater management, but it also shows that grey infrastructure is dominating the visual outlook in this area & this is not good for community wellbeing. The riverside parks would be offsetting this to a large degree, but only for the people that use these parks. Parks need good trees, shady trees & trees that are shaped liked trees, not shaped like street trees. Side branches are an inherent part of a tree & do not need their side branches to be pruned off when the tree is in a park. The beauty that a tree provides is an important asset in any park, so trees should be allowed to look their best. Monoculture is not a good look either. 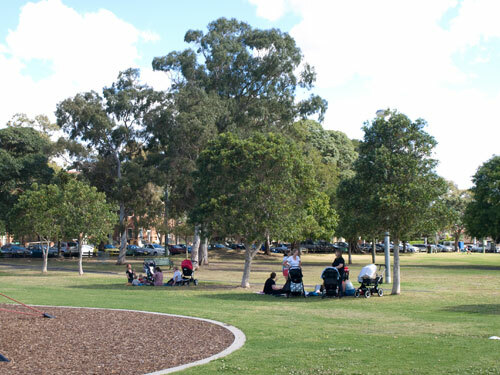 Parks also need sufficient seating, including seating away from busy areas such as playgrounds, barbeques & major pathways. Facing them to look at the view is a good idea. Older people or those with health issues often do not go to the park because of a lack of seating or they do not want to sit in or near the playground. Shade is also important. I don’t know about you, but the sun feels really harsh to me these days & I often find it too hot to be outdoors. Steel Park with its magnificent broad-leafed Poplars that provide dappled shade across the park bring coolness that is wonderful on a hot day. Kids can run where they please & people can spread out because they are not trying to fit under limited shade. A tin roof kiosk may look good, but you can bake sitting under these structures on a hot day. Trees cool & clean the air & that green that is so positive & potent to the human being’s health. All our parks should be filled with all kinds of trees. “Show me a healthy community with a healthy economy & I will show you a community that has its green infrastructure in order & understands the relationship between the built & the unbuilt environment.” ~ Will Rogers, Trust for Public Land. Marrickville’s newest park at the end of High Street & fronting Ruby Street. I don’t know if it has been officially named yet. Sydney Park is not in Marrickville municipality. I include it here because I think the trees & the variety of species is wonderful. Just imagine what this place will look like in ten or twenty years. They have planted hundreds of Fig trees too. This morning we went to participate with planting the new rain garden in the Marrickville Golf Course, but were too late. 45 people had come earlier & planted a whopping 1,200 plants. That’s a fantastic turnout. Instead we got to wander around this marvelous site. The rain garden is much larger than I anticipated. It has two sections. The first where stormwater comes down into the golf course at the junction of Bruce & Princess Street Marrickville. 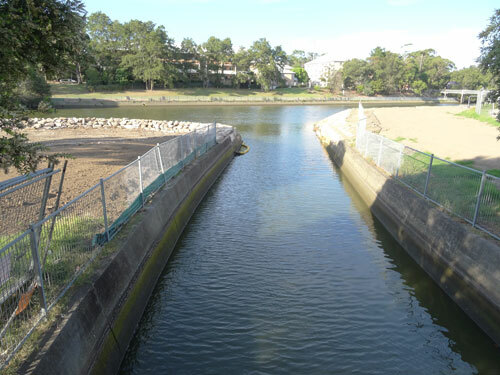 Approximately 65% of the Riverside Catchment is impervious surfaces, so a significant amount of stormwater enters the Cooks River from this neighbourhood. 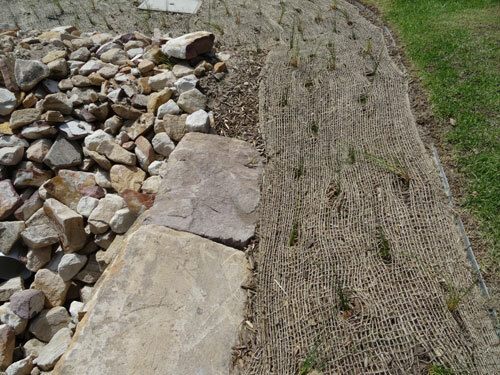 The water first enters a swale, then, moves into a large bowl that has been planted out with grasses with jute netting to stabilize the ground. From there the water is absorbed into the ground that has a three tiers – sand, then glass sand & at the bottom, rock aggregate. This slows down the water & cleans it of impurities. 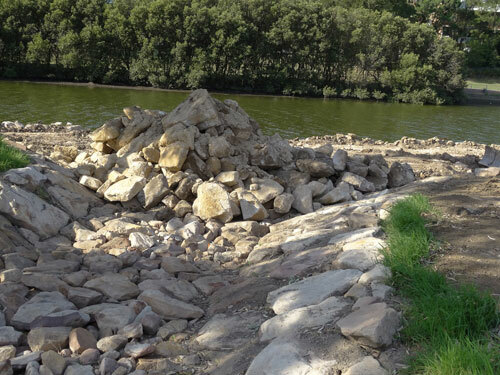 After this process, it is picked up by the stormwater system & taken down to enter into the Cooks River. Behind the major rain garden is another curved swale. This swale is to collect overflow of stormwater in a 1 in 100-year flood event. Between the two sites is a concrete path allowing the community to walk through the area & there is also a very nice wooden bridge. 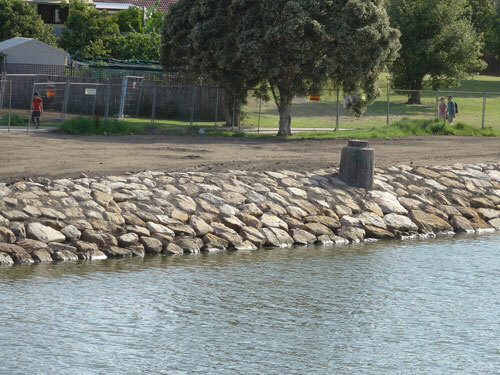 Council has also planted approximately ten Eucalyptus trees & some Leptospermum. It is wonderful to see trees added to the golf course. The rain garden & swale looks fantastic & once the plants have grown it will look even better. This site will be a good place for schools to visit to learn about stormwater management & the environment. It will also provide habitat for a range of local wildlife. 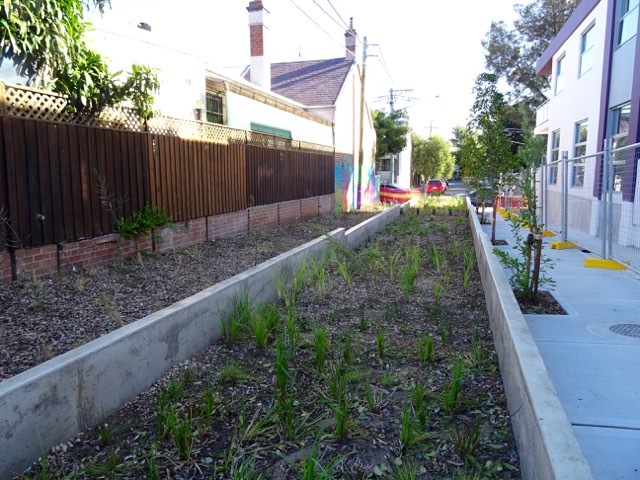 Marrickville Council has done a terrific job with the Bruce Street Rain Garden. This rain garden will continue to provide benefit to the environment for many decades to come. I was very impressed. This section of Kays Aveue East is to become a green lane. The resident here has already added plants to the exterior of the fence line & it looks good. When completed this area should be transformed into a lovely place. Kays Ave East has flooding issues & falls in the Riverside Crescent Subcatchment Area. 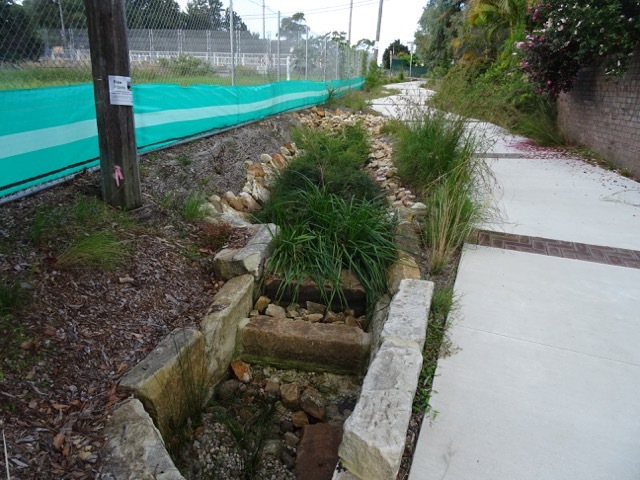 Council intends on building a rain garden & a swale to manage stormwater. They also intend to create a shared cycle/pedestrian path in the lane during 2014.
create more attractive & accessible places for people to live. contribute to a healthy environment through best practice water, tree & biodiversity management. coordinate works so there is less disruption to the street & increased efficiency. work with the community so they have input into their local area. filter & absorb stormwater through a rain garden. increase the amount of greening for habitat & biodiversity in the area. 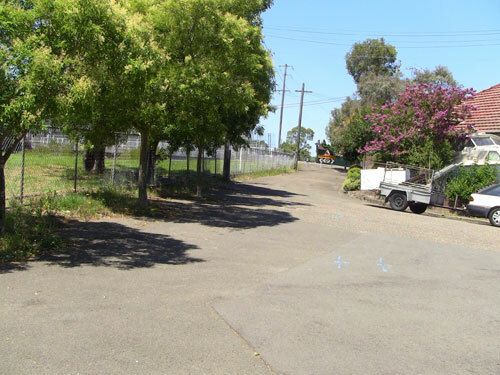 improve access for pedestrians & cyclists along the railway line & increase links to Dulwich Hill Station. I think this is a great initiative by Marrickville Council & will certainly add more beauty to the environment in this location. Anything that increases biodiversity improves the neighbourhood as far as I am concerned. One day I hope that Marrickville LGA has many of these green lanes. A green lane will be good for people, wildlife & the river. I will post photos when the works are completed. 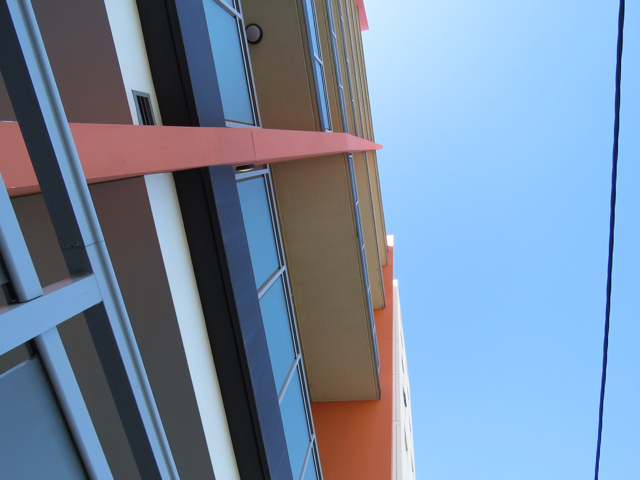 Looking up the slope of Kays Avenue East. This is a significant area to be greening & should significantly improve the neighbourhood. The red marks the location of the green lane. Although the map says Albermarle Street, this is Kays Avenue East. 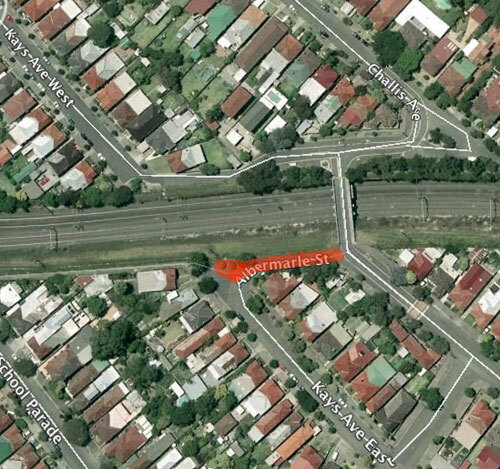 Albermarle Street is the street that runs parallel & crosses the rail line.